Am I the only big fan of this fragrance? Judging from the reviews I've read, I wouldn't be surprised. There was a fair amount of anticipation for this scent from perfume fans a few years ago, and when it was finally released in 2010, most people seemed to feel it was a letdown. That's all fine by me, because I think this fragrance is excellent. 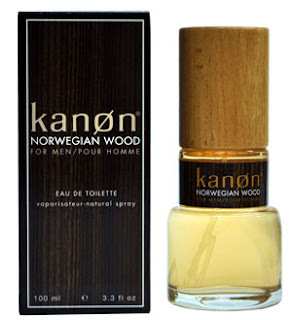 For me, Kanøn Norwegian Wood is like an improved Gucci Envy For Men. The two fragrances are remarkably similar: super spicy, woody, both have a strong ginger top note, and a light touch of vanilla in the base to give it warmth and smoothness. I own and like Envy For Men, but it has its flaws, and those are primarily a slightly synthetic crudeness and disappointing longevity. Norwegian Wood solves both problems by being smoother, more natural smelling, better balanced, more refined and much longer lasting; whereas Envy lasts about 5 or 6 hours on my skin, I get about 11 or 12 hours out of Norwegian Wood. Plus, Norwegian Wood has a touch of nutmeg up top that adds an extra spicy facet to the scent. This is a modern, classy and stylish fragrance that is spicy and bold enough to stand out from every other guy's cologne, but tasteful enough not to offend people around you. Considering how Envy For Men is now, allegedly, discontinued, and how this is an improvement on it, Norwegian Wood is a no-brainer if you love spicy oriental fragrances. Weird, you must be psychic or something. I've been toying with grabbing a bottle of this at Marshalls, and I just discovered it there yesterday. Prior to that, I had no idea this existed. It was a tough call because they're only asking $8 for it, but they also had Drakkar Noir for a surprising price. So I grabbed the Drakkar instead. Maybe next time for Nor/Wood. Thanks for the review, gives me more confidence in this one. Don't be fooled by the price tag, because this smells much more expensive than that. Its best quality is how well balanced it is. Nothing cheap or synthetic smelling about this one. I will review the original, which is probably my favorite of the three. Of the post-Armani Code brethren, Norwegian Wood is among my favorites but ultimately this isn't my favorite subset of masculine fragrances. Woody orientals aren't favorites of mine either, but NW is very good. I don't wear it much, but it's really satisfying when I do.